A few months ago, I started seeing adverts for a game called Game Dev Tycoon on Steam, which stirred my vacant soul into excitement. Every indication that I got from my quick glance at the available screenshots led me to believe that this was an evolved rendition of an iOS game called Game Dev Story. I immediately pre-purchased the game. 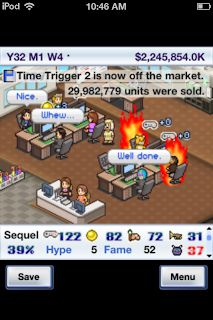 Game Dev Story was released in late 2010 by Kairosoft, a mobile game developer that specializes in simulation games with a nostalgic 16-bit aesthetic and a quirky sense of humor. Though Kairosoft's seems to abide by the same formula from game to game, I've found each of their games (that I've played) to be quite charming. 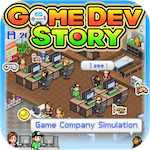 Game Dev Story is a video game about making video games. I played the role of a small video game developer, struggling to produce its first video games and generate enough money to produce more games and grow into a successful company. Yet, as fascinated as I am by the video game industry, it was Story's humorous retelling of the nearly 30-year history of video games that drew me in long enough for the addictively iterative nature of the simulation to get its hooks into me. One of the things that I find so charming about these games is the way that they humorously present the nearly 30-year history of video games. Obviously, they can't put the trademarked Nintendo Entertainment System into their game, but I can create games for the Intendro Entertainment System or the Vonny Playsystem. I took it upon myself to carry on with this playful alternate history, so I started developing games in some alternate universe, complete with bizarre versions of my favorite games: Super Sario Sisters, Sum City, Time Trigger, Snitcher, Need to Go Fast, etc. 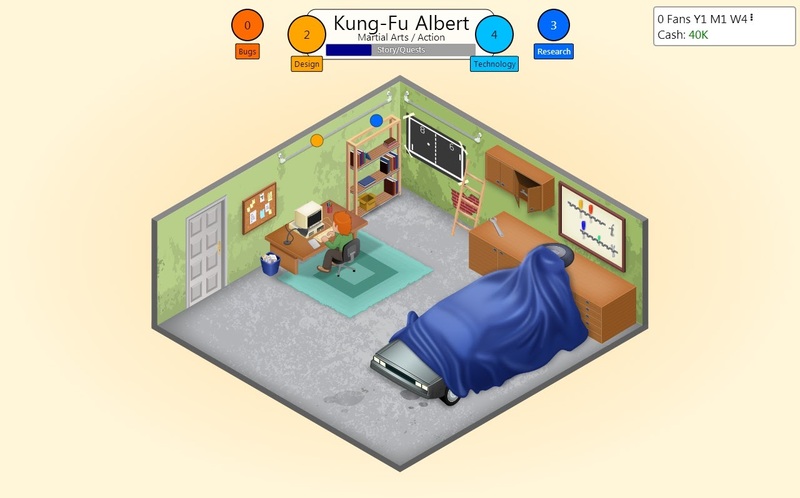 Game Dev Tycoon adds a little bit of complexity to the Game Dev Story formula, but the game is never overly difficult. The only way to fail (as far as I can tell) is to run out of money, and that's unlikely to happen once you come up with a few decent genre combinations. This results in a really nice balance of strategy and pace. The development process is accelerated to the point that I found myself going from conceptualizing a project to getting my final review scores in about 5 minutes. If I didn't get the review scores that I wanted, it would only be a matter of moments before I could be building a different game idea. It's the sort of tempo that begs me to play just one more round... just one more round... just one more round, which means that there were several occasions where I found myself awake well past when a responsible person would have gone to bed.